The research is clear. Time together around the dinner table has beneficial results including improving quality of daily life, your children's chances of success in the world, and your family's health according to the Family Youth and Community Sciences Department at the University of Florida. In fact, your child may be 35% less likely to engage in disordered eating, 24% more likely to eat healthier foods and 12% less likely to be overweight (Hammons & Fiese, 2011). A study done by The National Center on Addiction and Substance Abuse revealed that teens who eat fewer than three family dinners per week compared to those who eat five to seven a week are twice as likely to use alcohol and tobacco and one and a half times more likely to use marijuana.This isn't just for people with traditional careers and family lives. It applies to all families regardless of how busy your schedule or important your job, In her book The Obamas, author Jodi Kanter highlights the President's commitment to having dinner with his family five times a week. Unfortunately in the hustle and bustle of today's digital world, the art of the family dinner has been drained out of many homes with device interaction replacing face-to-face connection. During a panel discussion hosted by Common Sense Media that focused on raising caring kids in a digital world, Howard Gardner of the Harvard Graduate School of Education shared that many families are not even sure what to do at dinner time if all are free of digital devices. If this applies to your family, don't despair. 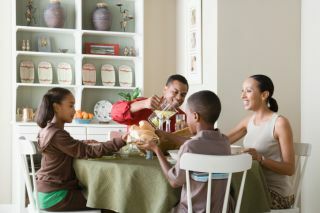 Instead, check out my article at Answers.com where I share ideas for dinner time activities for each day of the week. You can visit the article here.